The New Year offers great investment opportunities for retail investors as the country's economy looks to emerge from a prolonged lean phase. This is, therefore, time for investors to make smart decisions to reap the benefits of a reviving economy. Will 2014 be any different for retail investors, who have been battling high inflation and earning negative real returns from both financial and physical assets for the past one year? In 2013, equity markets remained tame due to slowing economy, bonds lost value as interest rates rose and physical assets such as real estate and gold also started feeling the effect of economic slowdown. However, a late revival in 2013 has investors and experts excited. The gross domestic product (GDP), a measure of goods and services produced in the country, increased 4.8% in the July-September quarter of 2013-14, as against 4.4% in the previous quarter. This was higher than the estimates of most economists and equity analysts. Already, brokerage houses have revised their 2013-14 GDP growth estimates from 4-4.5% to above 5%. The sentiment has been helped by the government's aggressive approach to controlling the current account deficit (CAD), a situation where imports exceed exports. The government has been successful in restricting gold imports, and as a result CAD, which was 4.8% of GDP in 2012-13, is likely to come down to 2.5-3% this financial year. Rupee depreciation concerns have also subsided. The Indian currency has found a level of 61-62 against the dollar and will find support around 65 even in a worst-case scenario. Fuelling hope further is the possibility of regime change at the Centre and the likely emergence of the Bharatiya Janata Party as the ruling party after the 2014 general elections. Its prime ministerial candidate, Narendra Modi, is being cheered by industrialists and market experts as harbinger of change in the Centre's approach towards economic and industrial policies. The results of the recent assembly elections in five states (in which the BJP got clear majority in three and emerged as the single-largest party in one) has further established the public sentiment in favour of the BJP. Equity markets cheered the victory with both the NSE Nifty and the BSE Sensex gaining over 1.5% on December 9, the day after the poll results were announced. Of course, there is also no dearth of factors that can spoil the party. The fiscal deficit (a situation where government expenses exceed revenues) continues to be a worry. The government has set the target for 2013-14 at 4.8% of GDP, but most experts say it will not be met. High inflation and interest rates continue to be a drag. The fear that the US Federal Reserve, or Fed, will further scale down its liquidity-injection programme, triggering a sell-off by foreign institutional investors, or FIIs, also looms large over both the rupee and stock markets. The Fed has already said that it will scale back the programme, called quantitative easing, or QE, by $10 billion to $70 billion a month from January. What do these mean for your investment portfolio in 2014 ? 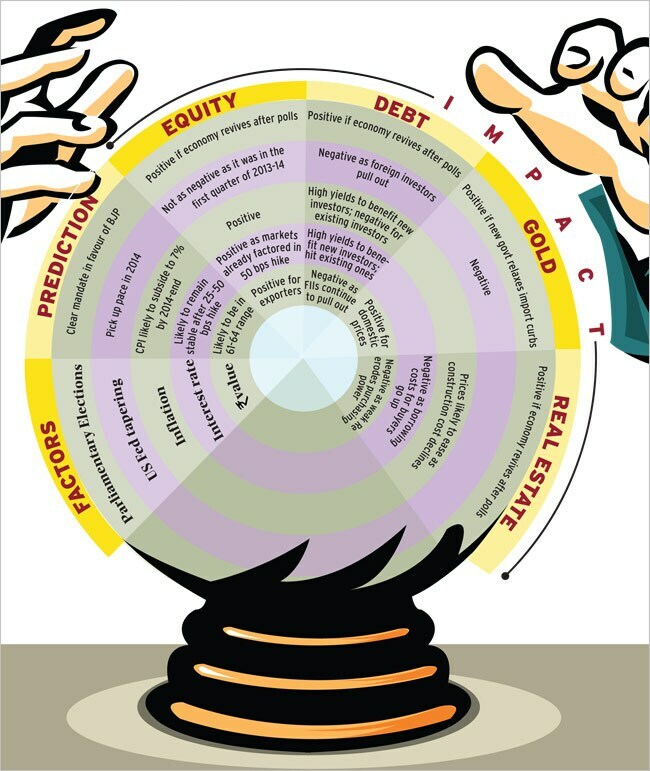 Let's take up each asset class one by one and see how these factors may impact their performance in 2014. Brokerages have already started their customary (they do it ahead of all major events, general elections in this case) 'crystal gazing', predicting possible levels for the Nifty and the Sensex under different scenarios. While global brokerages UBS and Goldman Sachs expect the Nifty to touch 6,900 by the end of 2014, Macquarie sees the index at 7,200 by the end of the next calendar year. While there are enthusiasts who have predicted that the Nifty will touch 7,000 as early as March 2014, most expect the rise to be a more conservative 10%. The Nifty closed at 6,166 on December 18. But investors are cautious. This can be because even if the government changes, markets do not expect any big change in the country's economic situation anytime soon. Apart from the uncertainty around poll results, another sword over Indian equity markets is reduction (popularly called 'taper') of the liquidity injection programme being carried out by the US Fed. This, according to a section of the market, is likely to spark an FII selloff. In 2013 (till December 12), net FII inflows into Indian equities were close to $19 billion (net outflow from debt was $8.2 billion) compared to $24 billion in 2012 (net inflow into debt was $6.6 billion). Of course not everyone has been carried away by the hysteria over election results and Fed tapering. "Out of the 'known unknowns' of 2014, the two most significant are elections and Fed taper. While both are likely to drive volatility given the set expectations around their impact, in our view, they will have a limited impact on the economy and corporate earnings. The market should, therefore, revert to trend soon after these events," says a Credit Suisse report released on December 2. India's economy faces bigger risks than election results and Fed taper. These include high inflation and interest rates, stalled investment cycle and rupee exchange rate. While a large section of market experts and players is pinning hope on Modi, the general sense in the market is that any government that is stable will be good for the economy and equity markets. Data since 1991 prove this. 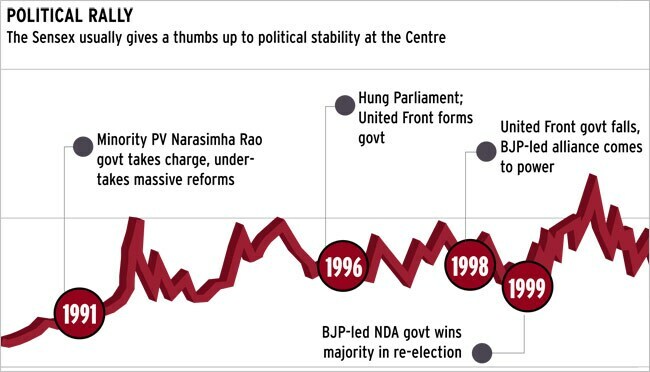 Equity markets rose 44% in three months after the PV Narasimha Rao government came to power in 1991, 15% after the National Democratic Alliance came to power in 1999 and 32% after the United Progressive Alliance won in 2009. In contrast, they fell 8% in three months after the Third Front formed government in 1996 and 12% after the BJP formed a government in 1998. Harsha Upadhyaya, senior vice president and head of equities, Kotak Asset Management Company (AMC), says a stable government will be positive for stock markets. "The fundamentals are good, but what is important is to have a stable government that can give shape to its policies," he says. However, a stable government is not enough. The government has to be pro-growth as well, say experts. Sankaran Naren, chief investment officer, ICICI Prudential AMC, says, "If we have a government at the Centre that is focussed on increasing growth and containing the fiscal deficit, we should have a sharp rally across sectors." Data since 1991 show that equity markets usually go up before general elections. Barring 2004, when they fell 11% in three months prior to the elections, they have risen before all elections since 1991-24% ahead of 1991 polls, 7% in 1996, 6% in 1998, 14% in 1999 and 27% in 2009. "We have seen on the last five occasions that the markets rally six months prior to the elections. They gained momentum before four of the last five elections and moved sideways before one. The interesting thing is that most of the times the trend continues after the elections as well," says Mahesh Patil, co-chief investment officer, Birla Sun Life AMC. Will there be a repeat this time? Analysts see the government taking populist measures ahead of the elections given the way the ruling party has been decimated in the recent assembly elections, damaging the sentiment in equity markets. So, should you wait for a clear picture to emerge in 2014 or place your bets now in expectation that the sentiment will improve irrespective of which party forms the next government? For retail investors, taking decisions on the basis of an event (for instance elections in 2014) is a bad idea. For them, it's best to stagger investments. They must invest in a systematic manner, either directly or through mutual funds. "Our suggestion to investors is that they must adopt a bottom-up approach and look at companies from a long-term perspective, irrespective of the election outcome. A top-down approach can be adopted once the election outcome is clear," says Modan Saha, joint managing director & chief executive officer, retail broking, Axis Securities. In the bottom-up approach, the focus is more on selecting stocks rather than zeroing in on the favoured sector or industry, while in the top-down approach, investors first identify the best sector(s) and then pick stocks. One of the immediate risks to Indian equity markets is the Fed taper. The US central bank, through its bond-buying scheme, has been injecting $85 billion into the system every month. It plans to reduce this to $75 billion from January. As a part of this money is entering emerging markets such as India, there is fear that the Fed move will drive away FIIs from both equity and debt markets. However, a section of analysts believes that equity markets have already factored in the impact of taper. They say that as the economy has started showing signs of revival, FIIs may not react adversely to the taper. Dr Ashima Goyal, professor of Economics at Indira Gandhi Institute for Development Research, says, "As India's fundamentals improve, tapering will affect India less." She says equity flows are still the dominant component of FII investments and these are influenced more by domestic growth and risk factors. "Moreover, the taper is likely to be gentle, with the Fed aiming to reduce its impact on short-term rates," says Goyal. Badrish Kulhali, fund manager, fixed income, HDFC Life, says tapering will not have the same impact on Indian markets this time as it would have had in summer. "Any investor who was concerned about it would have already exited India," he says. This, he says, is because India's macroeconomic parameters have undergone a significant change in the past six months. The Reserve Bank of India, or RBI, has shored up forex reserves, and the government's restrictions on gold imports and high export growth have compressed the trade deficit significantly. Another reason is that FIIs have already pulled out in excess of $10 billion between May and August. According to Kulhali, such huge outflows are unlikely. However, uncertainty about the future of tapering continues to make markets nervous. "There will be knee-jerk impact for a short period," says Modan Saha of Axis Equities. However, tapering also signals revival of the US economy, which may be positive for many Indian companies which export to the US and have operations there. "So, while the financial world will feel the heat, the economic world will rejoice," says Saha. These have a significant bearing on equity markets. As long as inflation remains high, interest rates will not come down, discouraging companies from borrowing. This means companies will delay capital expenditure, further affecting the economy and equity markets. In November, both consumer price inflation or CPI (up from 10.2% in October to 11.24%) and wholesale price inflation (up from 7% in October to 7.5%) spiked, increasing the chances that the RBI will keep interest rates high for some more time. Stock markets shed a few points after these figures were announced. The question, though, is, which way is inflation likely to move in 2014? "We expect CPI inflation to decelerate to 7% in a sustained manner by December 2014 after five years of staying around 10%," Morgan Stanley said in a December 2 report. "Inflation is unlikely to remain high for long. The recent uptick has been due to food prices as well as currency weakness," says Kulhali of HDFC Life. He expects inflation to stabilise over the next few months, and reverse course thereafter. If inflation comes under control and the RBI starts cutting interest rates, the rate-sensitive sectors will benefit. "All rate-sensitive segments such as auto, FMCG, banking, capital goods and well-managed construction companies will benefit from lower interest rates. But infrastructure companies may still find it difficult to negotiate for lower interest rates from banks and so should be avoided," says Supreeth S M, CEO, Quant First Alternate Investment Trust. Despite the general euphoria, investors cannot take anything at face value. 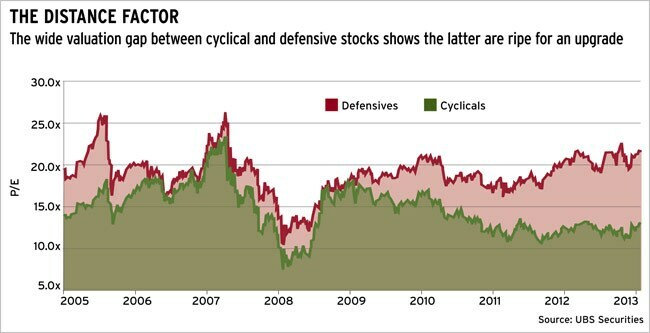 Equities carry both immediate and medium-term risks. Besides, the uncertainty over election results and future of the Fed taper will keep investors on their toes. It's important, therefore, to have an investment strategy in place. For long-term investors, the best approach is 'Buy Systematically, Buy Good'. For medium-term investors, buying good stocks at the right value is also crucial. Valuations, therefore, are the key, given that the Sensex and the Nifty have already risen around 15% in the past four months and touched their all-time highs recently. The Nifty breached 6,400 while the Sensex crossed 21,300 on December 9. However, the difference between the Sensex crossing 21,000 in 2008 and now is that in 2008 the Sensex was trading at a 12-month forward price-to-earnings multiple of 24.6 times. This time, it is at 14.9 times. Besides, the latest maket rally has been limited to large-cap stocks, which has left a huge valuation gap between large-caps and mid- & small-caps. "A significant number of stocks are still in the red while a select few are at their peaks. It is, therefore, fair to say that valuations across a range of stocks are still reasonable," say Puneet Chaddha, CEO, HSBC Global Asset Management, India. According to Modan Saha of Axis Securities, the rally has been primarily driven by large-caps in select pockets such as IT, pharmaceutical and private sector banks. "If we ignore their contribution, sectors such as infra, capital goods, metals, oil & gas, PSUs, telecom and real estate are trading at the low quartile of their historical valuation. 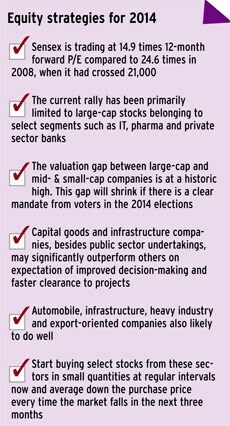 The gap between large-cap and mid- & small-cap companies is at a historic high and will shrink if there is a clear mandate from voters, which should trigger economic reforms and faster decision-making," he says. He adds PSUs and capital goods and infrastructure companies may significantly outperform broader markets. Investors should start buying stocks in small quantities now and lower their average purchase price at every fall for the next three months, says Supreeth S M of Quant First Alternate Investment Trust. "Before elections, there is possibility of a slight dip, which should be seen as an opportunity to average out the purchase price." He is bullish on stocks of automobile, infrastructure and heavy industries companies. "Export-oriented industries will also do very well." Sankaran Naren of ICICI Prudential AMC says it is time for retail investors to go 'neutral weight' (from underweight) on equities and overweight on fixed income. In his view, in the current market, value investing is the way to go, because it involves buying largecap, mid-cap as well as small-cap stocks. Also, it is not constrained by sectors or themes, and, hence, one can invest in stocks belonging to most sectors except FMCG and to a lesser extent technology and pharmaceutical. Persistently high CPI inflation has kept real interest rates negative since the 2008 credit crisis, encouraging households to reduce financial savings and increase allocation to gold and real estate, according to a Morgan Stanley report. India Ratings and Research says that with the exception of countries that are implementing unconventional monetary policies, India, within the emerging market group, has one of the lowest real interest rates, less than even the pre-crisis (2008) level. Will this change anytime soon? It has been seen in the past that inflation usually does not fall in the run-up to general elections (since 1991, only once, before the 1999 elections, has CPI moderated). Therefore, expect inflation to remain at elevated levels, at least in the first half of the year. The RBI will counter this by increasing interest rates so that the real rates are attractive for savers. "Policy rates may remain stable for a while after an additional 25-50 basis points, or bps, increase between December 2013 and March 2014 as the RBI seeks to control inflation without significantly impacting growth revival," says Navneet Munot, chief investment officer, SBI Mutual Fund. Any increase in interest rates will result in high bond yields and bank fixed deposit rates. This will be good for those looking to invest in fixed-income securities. "We expect interest rates to remain firm during the first half of 2014, unless inflation pressures abate significantly. Hence, fixed-income investors can benefit from the relatively high yields, and then potential capital appreciation once interest rates start falling," says Santosh Kamath, CIO, Fixed Income, Franklin Templeton Investments - India. What are the options for retail investors? While bank fixed deposits remain an obvious choice for most, debt funds such as fixed-maturity plans, or FMPs, and corporate bond funds are a smart way to build a debt portfolio that can benefit from high bond yields. One can also look at tax-free bonds, non-convertible debentures, or NCDs, and inflation-indexed bonds. Banks are offering between 9% and 9.5% (pre-tax) on fixed deposits. If there is a 25-50 bps increase in rates at which the RBI lends to banks, the latter may increase deposit rates in the next couple of months. NCDs issued by companies are offering 11-12%. Those looking to invest in these must prefer high-rated NCDs and not go by interest rates alone. This is to keep the possibility of default to the minimum. Though NCDs are backed by assets of the company, recovering money in case of a payment default is a big hassle. Interest earned on both bank fixed deposits and NCDs is taxable. 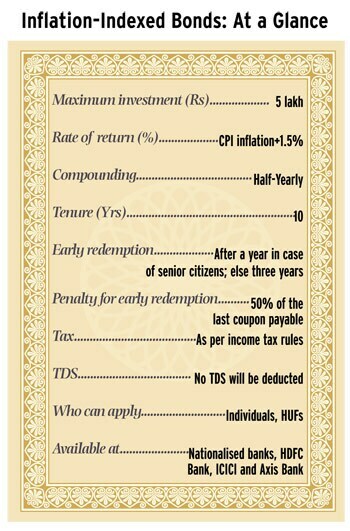 Tax-free bonds are offering less than the rates on government bonds of similar maturity. At present, 10-year government bonds are trading around 9%. Any increase in interest rates will lead to a spike in yields, making these bonds attractive for new investors. Since interest earned on tax-free bonds is not taxed, their effective yield is very high, especially for investors in the 20-30% tax bracket. The RBI is likely to soon launch inflation-indexed national savings securities through banks. The interest offered will be CPI plus a premium of 1.5%. The CPI rate used to calculate the coupon will be three months old. That is, the coupon of bonds issued in December will be based upon the CPI level of September. If the CPI inflation in September was 10%, the minimum coupon on an inflation-indexed bond will be 11.5%. With CPI in October and November staying above 10%, inflation-indexed bonds issued in the next couple of months will have a coupon of more than 11%. However, interest earned on these bonds will be taxable. This makes them less attractive for investors in higher tax brackets. "Inflation-indexed bonds are quite attractive as a concept. However, on a closer look, the structure suggested by the RBI makes it a negative real return product because of the tax incidence. The product is attractive only for retail investors who are in the lowest tax bracket," says Puneet Chaddha of HSBC Global Asset Management. Given the high yields on corporate (9-11%) as well as government bonds (around 9%), besides attractive yields on money market instruments such as treasury bills and CP/CDs, debt funds are offering an array of tax-efficient investment options. The debt fund category includes products suitable for investors with different horizons and risk appetites. One can invest in passive buy-and-hold type of funds such as FMPs or take duration bets with dynamic bond funds. There are funds which take exposure only to corporate/government bonds, there are funds which have a very short-term horizon (liquid and ultra short-term funds) and then there are medium- and long-term funds. Which of these are ideal for 2014? It depends upon your investment horizon and risk appetite. "With medium-term rates attractive, investors may choose between FMPs and short-term funds depending upon their liquidity requirements. 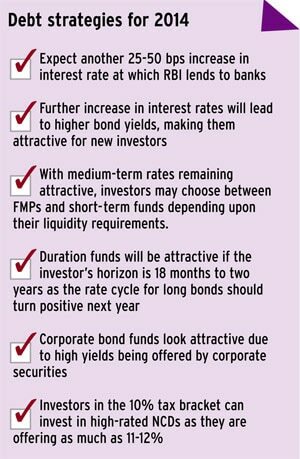 Duration funds will be attractive if the horizon is 18 months to two years as the rate cycle should turn positive for long bonds sometime over the next year on concerted policy actions to control inflation," says Munot of SBI Mutual Fund. "Investors should also look at corporate bond funds that can take advantage of the high yields being offered on corporate securities. In addition, those with a longer horizon (one-two years) can look at long bond funds that can offer a combination of high yields and capital appreciation," says Kamath of Franklin Templeton Mutual Fund. In the absence of better returns from financial assets, real estate was most favoured by investors for the past five years. However, 2013 was different, as prices moderated and inventory rose sharply. What's in store for real estate investors in 2014? Will there be a further price correction and more opportunities for investment? "I definitely foresee a correction across many cities. In fact, it is overdue. We are seeing a massive inventory of residential units in the larger cities. Developers with large shares of this will have little choice but to yield to the pressure on prices," says Colin Dyer, president and CEO, Jones Lang LaSalle Inc. However, he feels that in areas where demand exceeds supply, there may not be any price correction. "Properties bought for investment will see more price corrections," he says. One of the reasons for the decline in demand is affordability. There are few options in the affordable housing category. Besides, the economic slowdown has affected incomes, diminishing the purchasing power of prospective buyers. Lalit Kant, head, real estate, Arthveda Fund Management, says homes are becoming more and more unaffordable because of the sharp fall in people's purchasing power. This has happened largely due to the economic slowdown, which has affected incomes, impacting people's ability to pay EMIs. But these factors have not yet led to any price fall, the reasons being the high land cost, delays in approvals (these can take one-and-half to three years depending upon the location and size of the project) and high labour, material and marketing costs. 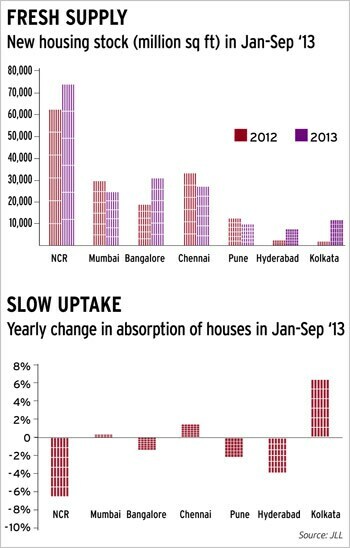 "If you were to look at the last two years, land valuations have gone berserk. Meanwhile, persistent high inflation has resulted in increase in labour and material costs as well," says Viswajit Srinivasan, director, wholesale lending, Capri Global Capital, a company in the asset financing and lending business. Kant says that despite low demand, builders are keeping card prices high as any downward revision in 'official' rates can have a cascading effect and cause a price crash. Two events can significantly alter the real estate market in future-the passage of the real estate Bill and final guidelines on real estate investment trusts or Reits. Reits are close-ended schemes that raise funds from the public and invest in real estate with an aim to provide returns to unit holders. If Reits become a reality, people will be able to invest as little as Rs 2 lakh in the real estate market. This will enable the sector, which is finding it difficult to raise money, get access to a new funding avenue. Besides, it will offer private equity funds and NBFCs an option to exit realty projects. Dipesh Bhagtani, executive director, Jaycee Homes, says, "Reits could help companies raise funds. They will also encourage developers to think about long-term wealth creation." The other significant event could be the passing of the real estate Bill. The Bill, which is for projects spread over at least 1,000 square metres or involving more than 12 apartments, requires all approvals to be in place before launch. It also has a provision to prevent developers from using money received for one project to fund any other project. Industry players say the Bill will increase project costs. Malhar Majumder, director, Gliese Consulting, says, "The cost of regulatory compliance may increase prices in the short run." Though there may be a further price correction in 2014, any drastic fall is less likely considering that the input costs have increased sharply over the last few quarters. The regulator's presence may increase costs but will also remove opaqueness in pricing and thus bring down prices over time. Gold lost its sheen in 2013 with prices declining 27% (from $1,700 to below $1,250 an ounce or oz) in the international market. In the domestic market, after giving 25% average return for five years, it fell 3.5% in 2013. This was primarily due to strengthening dollar (gold is used as a hedge against the dollar). Domestic prices, however, showed some resilience due to import curbs, which created a shortage during the festival season. 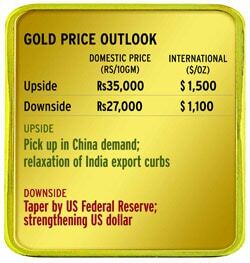 The next year will bring some serious risks to gold prices-further Fed tapering and strengthening of the dollar. Though experts believe that markets have already factored in the taper, they feel that as and when the Fed increases its speed, gold prices will fall. "The gold market could beat a retreat below $1,100 towards the end of 2014 as US monetary stimulus is withdrawn, fuelling talk of rising interest rates," says Renisha Chainani, commodity analyst, Edelweiss Financial Services. However, she adds that there will be a point when gold will be oversold and will rebound sharply, with resistance at $1,300 and $1,400. A November 22 Goldman Sachs report has predicted at least 15% decline in gold prices in 2014 as it believes "gold is yet to fully adjust to the reality of tapering, and is vulnerable to further weakness when the central bank finally begins to wind down its monetary stimulus". However, optimists see support from China demand and relaxation of import curbs by India. India and China are the biggest consumers of the metal. "Moving ahead, gold prices should benefit from physical demand from China, which is set to beat India as the world's largest gold consumer. Likewise, central banks continue to add gold to diversify holdings. And the markets have already priced in some tapering," says Jayant Manglik, president, retail distribution, Religare Broking. Manglik expects gold to remain in the range of Rs 27,500-Rs 35,000 per 10 gm. In dollar terms, he sees gold at $1,180-$1,500 an oz. 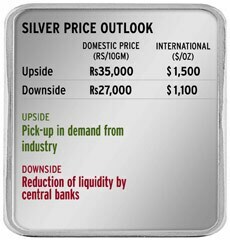 Silver prices are likely to remain volatile with an upward bias. In 2012, prices dropped from Rs 57,500 a kg to Rs 44,500 a kg, a fall of 22%. In the international market, the fall was from $30 an oz to $21 an oz. In the short term, the price trend continues to look bearish, and prices may test the previous low of $18.20 an oz. In the domestic market, if prices remain below Rs 45,000, there is a possibility that they may fall to Rs 42,000 or Rs 40,000 in the short term, says Renisha of Edeleweiss Financial Services. However, according to her, in the long term, prices could head towards $25 globally and Rs 55,000 domestically. Mangalik sees silver trading in the range of Rs 38,000-63,000 in local markets. The New Year offers great investment opportunities for retail investors as the country's economy looks to emerge from a prolonged lean phase. Equity and debt are poised to offer good returns. Even gold and real estate may take a cue from these two assets, albeit with a lag. This is, therefore, time for investors to make smart decisions to reap the benefits of a reviving economy.